Today I think I will fill you in on my experience in New Orleans. We made this trip so that I could attend the American Library Association’s Annual conference. For a week, more than 20,000 librarians converged on the city. Everywhere you looked you could see determined and sensibly dressed women (and men!) carrying red ALA tote bags, and checking schedules on their smart phones. I’m sure the city, which has a huge convention center, is used to large professional conferences, but New Orleans has a special appreciation for librarians. The ALA plans its conference years in advance, and in 2006, the Annual (as it is known) was scheduled to be in New Orleans. 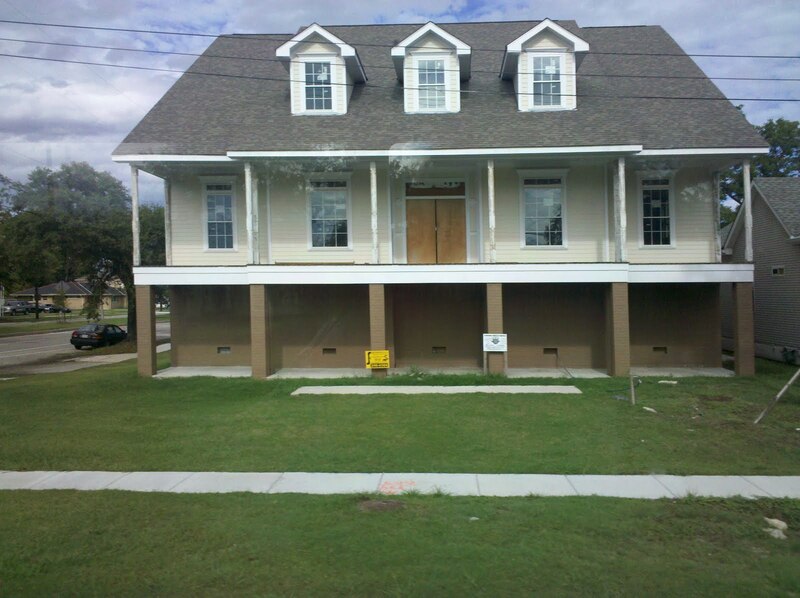 After Katrina hit, the ALA debated moving the conference but ultimately decided to proceed as planned. I spoke with people who’d attended the Annual that year, which was the first conference to be held in New Orleans after the hurricane. One librarian told me that most of the stores were closed, and whole city blocks stood empty. She said that the city had bussed people in to work in the restaurants and hotels. Another woman told me how she would sit in a café reading and would be approached again and again by locals asking for her magazines. At that point, almost a year after the storm, nothing but essential mail was being delivered by the post office. “Some people didn’t want to come to the conference,” she said, “but I thought it was our duty to come and just spend as much money as we could.” At the opening ceremony this year, Mayor Mitch Landrieu personally thanked the ALA for all it had done to support the city. I didn’t attend that conference in 2006 because I was in England getting ready to start working at the prison. 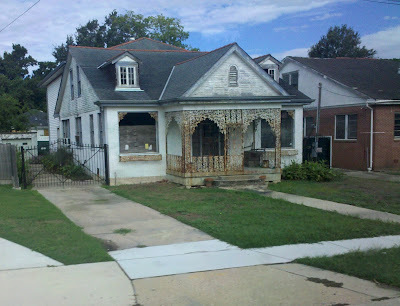 Though I had followed the news closely when it happened, it was hard for me to imagine the level of destruction and devastation Katrina had wrought on the gulf. And I’d sort of assumed it had been rebuilt by now. Certainly that was my first impression of the city, from the downtown area where we stayed on the edge of the French Quarter. From the pictures my mother posted yesterday, there was little evidence of the storm. The beautiful houses in the garden district all had a freshly painted look to them –as did the buildings in the French quarter. Aside from the slightly “new” look on old buildings, everything looked perfect. As part of the conference, I spent one day volunteering in a school library. It was downtown, just off Canal street and a group of us were bussed there from the conference center. The bus driver either misunderstood our destination or decided to deliberately take us the long way, but we wound up taking what the school director called “The Misery Tour.” The bus headed uptown, beyond where the street cars stopped and drove through a lower-income residential neighborhood. These homes, though smaller than the Garden District mansions, were still average sized older family homes, with porches and yards and playground sets. 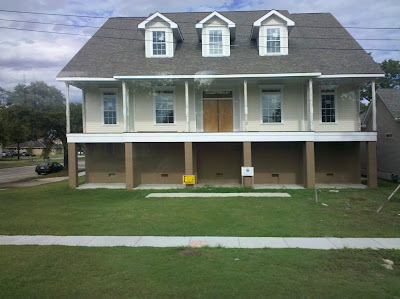 It would have looked like a nice place to live except that half of the homes stood vacant, boarded up and caved in. On many doors and walls it was still easy to read the spray-painted code used by rescue teams in the days following the storm: an X with the date the home was searched, and number of dead or living inhabitants.